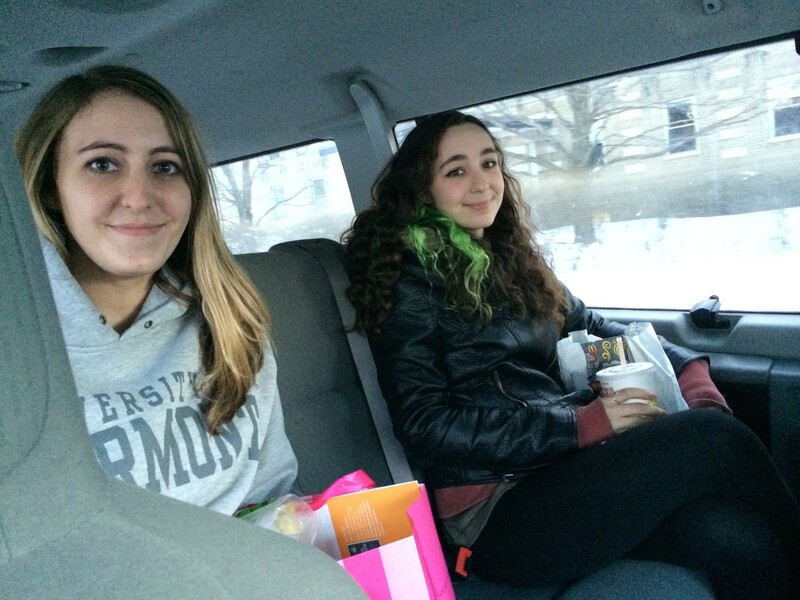 Christina Hart, left, and Zoe Gagnon, right, share a taxi ride from their jobs at the University Mall home to downtown Burlington Monday evening. As St. Patrick's Day revelers filtered onto Church Street yesterday evening, they stumbled upon a scene that may have been more raucous than the one they had just left behind: Roughly 50 people marching in a circle at Church and Cherry streets, shouting "Union jobs are here to stay," and "Get up, get down, Burlington is a union town." As the first day of their strike wore on, Chittenden County Transportation Authority bus drivers continued to express displeasure with management — and their would-be customers began voicing their own opinions. Winooski resident John Satenstein, who usually relies on CCTA for most of his travel, had to walk to downtown Burlington for an appointment. But, as he surveyed the picket line on Church Street, he said he hoped that drivers would prevail in their quest for a more favorable contract. "I believe in their concerns about working conditions," Satenstein said. "Their employers should be supportive of them. It's an issue of the people." Others offered a less generous view. Gary Showers usually takes an 8:30 p.m. bus from his home in Burlington's North End to the Hannaford grocery store on Shelburne Road, where he stocks shelves during the overnight shift before returning on the 6:30 a.m. bus. Yesterday, Powers walked back and forth to work in frigid temperatures and said he was upset that drivers — who make far more than his $10-an-hour wage — had left him stranded. "It's frustrating. How do you get to work with this crap?" Showers said as he watched the evening protest. "They're driving people that are poor. I don't make that much." Across the city, residents grappled with the loss of a service that provides about 10,000 rides a day. Drivers went on strike after repeatedly voting down contracts they say contain arduous working hours and allow the agency to hire part-timers who could threaten their full-time jobs. CCTA management says the drivers' split shifts, a key sticking point in the negotiations, are an unavoidable part of a transportation business that sees high demand in the morning and evening. Robar said many of the people calling were frustrated and had little patience when they were told what the wait times for a cab would be — sometimes more than an hour. “Angry beavers,” Robar dubbed them. Christina Hart lives in downtown Burlington and for the last six years she’s depended on the bus to deliver her to her job at the Victoria’s Secret store in the University Mall in South Burlington. She called six different cab companies Monday morning after her ride fell through. They all told her the same thing: They were too slammed to take additional customers. Hart ended up asking her ex-boyfriend’s mother to drive her to work and she took a Benway’s cab home. Both Hart and the woman sharing her cab, Zoe Gagnon, who works at McDonald’s at the mall, agreed that commuting by cab would quickly break their budgets. “It gets to a point where you’re working for free,” Gagnon said. The Burlington High School parking lot saw more traffic than usual, as parents picked up students who usually take a CCTA bus home. About half of the Burlington School District's students rely on CCTA buses. Phyllis Bristow-Johnson usually waits for her two high school daughters to come home after a short trip on a bus, a few miles away from the campus. Yesterday, she waited for them to walk out of the school and was then going to take them downtown, where one had a medical appointment. She estimated that she would spend three hours driving this day, when, on a normal night, she would let her children ride the bus and wait for them at home. But Bristow-Johnson said she understood the drivers' decision. "I'm not going to say they don't have legitimate grievances," she said. "It sounds like they might." Students huddled in groups at the school’s entrance. Fabian Baumann, a senior, normally takes the bus, but instead, he had a 45-minute walk in the morning. Baumann was one of several students who suggested the Burlington School District should have supplied alternative forms of transportation. “They could have at least rented yellow buses,” agreed freshman Anna Messinger. Kennedy Irakoze, a freshman, had a 30-minute walk to school, but he was getting a ride home from a friend’s father. “Buses are the only way I can get anywhere,” Irakoze said. “It’s a bad decision [to go on strike]. It’s like negative 25 degrees.” Irakoze said his parents have a car but he’s got a big family, so it’s in high demand.